Weird & Unusual Collectors' Items - Some are for Sale! Looking for a Memorable Gift that is Way out of the Ordinary? At 6 weeks after conception a pig embryo becomes a fetus [older spelling =foetus] - i.e. all major organ structures have now developed. At this time the bones of the skeleton are beginning to ossify i.e. 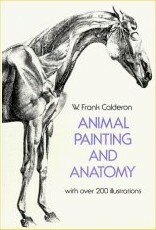 to lay down calcium on an existing framwork of cartilage [gristle]. Ossification begins from a large number of tiny locations called "Ossification Centres" which have been stained red with the dye Alizarin in this specimen. This swine fetus is about 6.5 weeks after conception. The total duration of pregnancy (gestation) in the pig is "3 months + 3 weeks + 3 days" i.e. 114 days total. Veterinary significance of this specimen: If a pig embryo dies before the 6th week of gestation, no calcium-enriched bones have been laid down and embryonic death is followed by degeneration and leaves no lasting trace. However at 6 weeks the embryo becoems a fetus and the bones become ossified with calcium salts, so that fetal death leaves a lasting trace, for example a "mummified fetus" [dry and shrivelled], which is either expelled during the birth process ["farrowing"] as a "mummy" or remains in the sow's uterus indefinitely, becoming eventually a "macerated fetus" in which the flesh is progressively lost until only a skeleton remains, and the sow is infertile. Source of this Fetal Piglet: This piglet came from the pregnant uterus of a sow obtained from a UK abattoir. The sow may have been culled because of serious injury or lameness, or she may have been culled in the wrong belief that she was infertile. Laboratory Preparation of this Demonstration Model: After collection, this porcine fetus was treated with formalin to fix the proteins and prevent decomposition, followed by dehydration with acetone, then cleared and stained in KOH-alizarin red S solution and finally stored long-term in glycerine. [Glycerine, also known as Glycerol, is sometimes added to foods and drinks as a humectant, solvent, sweetener and preservative. This pig fetus is certainly a very well-preserved specimen - it is just over 30 years old! Must be your skin that I'm sinkin in! 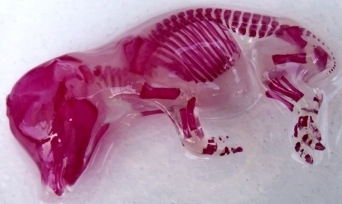 The body of the piglet has been clarified [made almost transparent] with potassium hydroxide, then the developing bony skeleton was stained red to show the amazing number of ossification centres from which the skeleton grows. 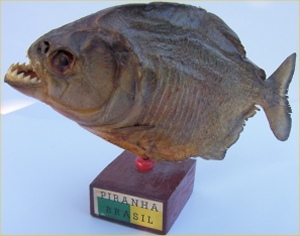 The Piranha is a carnivorous South American fish found especially in the Amazon river in Brazil. Flesh-eating and voracious - will attack humans and animals who fall into the water if it smells blood from a cut or wound. Also called Caribe or Pirana. From the moment tiny baby Brazilian piranhas hatch from their microscopic eggs, they come into the world armed and dangerous. Baby piranha will feast on tiny crustaceans, fruits, seeds, and aquatic plants. Once they reach about 1.5 inches in length they begin feeding on the fins and flesh of other fish that wander too closely. As they grow larger they begin to venture out in groups (schools) of about 20 fish where they use a variety of hunting strategies to kill and eat their prey. Heck, they don't kill their prey first, they just start eating the victim alive - that's what makes them so ferocious. Adult piranha have been known to eat their own offspring!